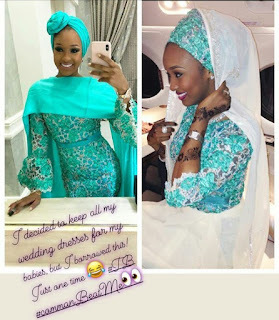 Home / News / News:A daughter of Nigerian billionaire, Mohammed Indimi has revealed that she re-rocked her wedding dress to Fatima Dangote's wedding. News:A daughter of Nigerian billionaire, Mohammed Indimi has revealed that she re-rocked her wedding dress to Fatima Dangote's wedding. A daughter of Nigerian billionaire, Mohammed Indimi has revealed that she re-rocked her wedding dress to Fatima Dangote's wedding. Rukayat, the daughter of billionaire oil mogul, Mohammed Indimi has revealed that she wore one of her wedding dresses to Fatima Dangote's wedding. Dangote's daughter wedded over the weekend in a wedding attended by many dignitaries. Rukayat, the stunning mother of two got married to Usman Dantata, the son of late billionaire industrialist, Alhaji Usman Dantata, in 2013.